The Old Saddlery in Colkirk, near Falkenham, Norfolk sleeps 5 people. The Old Saddlery near Falkenham is situated in a quiet position overlooking grazed meadowland, quite often the flight path of the resident barn owl; The Old Saddlery is a short distance from the main 16th-century Colkirk Hall farmhouse, rumoured to play host to members of the Gun Powder Plot. The property dates back to the mid-1700s, formally a cart shed and stables and latterly a saddlery through until the mid-1980s when it was remodelled into the Old Saddlery. Great care was taken to preserve some original features such as the beams, but to provide all the modern conveniences needed for a great stay. 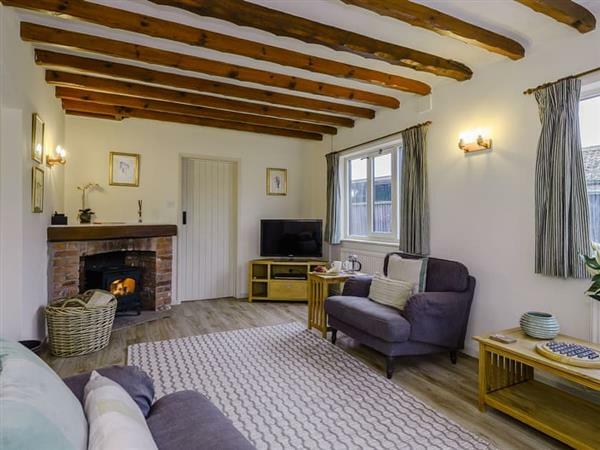 With two bathrooms, one of which features a free-standing bath, and a cosy living area with a wood burner, there are really lots of reasons to choose this cottage for your holiday. Coast lovers can be in Wells-next-the-Sea in 20 minutes. Here you will find a wide sandy beach with pretty coloured beach huts, a picturesque quay and a lovely assortment of boutique shops, cafés and restaurants. Head west and explore a coastline littered with pretty coastal villages with beaches and marshes galore. Go as far as Hunstanton and enjoy all the fun of the fair or explore the Sealife Centre. Then head east and stop off at Blakeney to enjoy the traditional pursuit of crabbing or visit Cromer with its famous pier and seasonal end of pier show. The Holkham Hall and Blickling Estates are within easy reach, as is Sandringham, the Hanseatic Quarter of Old Kings Lynn and the medieval city of Norwich. The beach is 13 miles from The Old Saddlery near Falkenham. With the shop 1½ miles, the pub is ½ mile and the restaurant is 4½ miles from The Old Saddlery. Bedroom 2: With twin beds and en-suite with bath, shower cubicle, toilet and heated towel rail (also accessed from hallway). Bedroom 3: With king-size bed, Velux window and sloping ceiling. Bathroom: With free-standing bath, toilet, heated towel rail, Velux window and sloping ceiling. Gas central heating, electricity, bed linen, towels and Wi-Fi included. Initial logs for wood burner included. Travel cot, highchair and stairgate (bottom of stairs only). Welcome pack. Enclosed lawned garden with sitting-out area and garden furniture. Bike store. Private parking for 2 cars. No smoking. Please note: This property has a natural water supply from a borehole. Holidays at The Old Saddlery run from Monday to Monday. Pets allowed at The Old Saddlery. For a better idea of where The Old Saddlery is, you can see The Old Saddlery on the map below. The Old Saddlery is in Norfolk; should you be on the lookout for a special offer, you can find all the special offers in Norfolk. It's always worth checking to see what is on offer at the moment. Do you want to holiday near The Old Saddlery (UK10364), you can see other cottages within 25 miles of The Old Saddlery; have a look to find your perfect holiday location.